You must have guessed by now this Captain Kalem Starland character sketch makes him appear to be a Caucasian male from planet Earth. Actually, he is a renowned fighter pilot in the space fleet of the benevolent Galactic Inter-dimensional Alliance of Free Worlds. He embarks on a secret mission to try and keep the planet Earth in our present time from being destroyed by a single power-mad enemy. 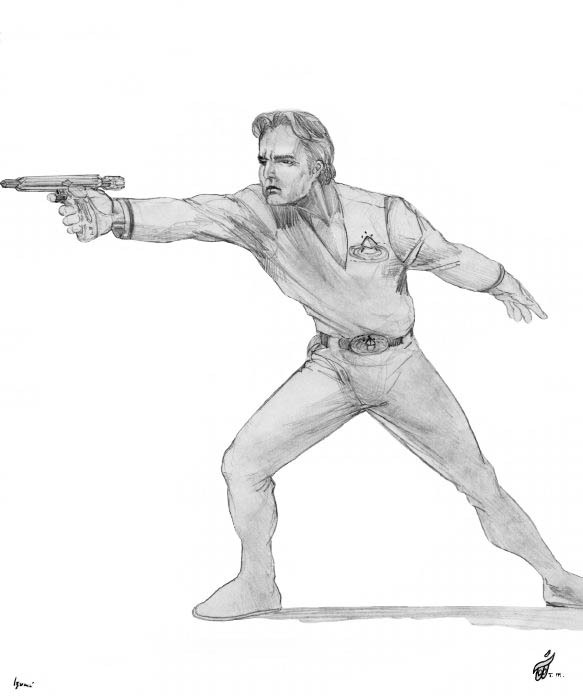 This Captain Kalem Starland character sketch does reveal he is human. However, true galactic history 101 reveals that no human being ever evolved on Earth in the first place and Kalem is not from our world. Now there is a mystery worth investigating because hidden secrets are revealed ever more deeply through chapters of The Emerald Doorway (Three Mystic Crystals) book one of The Parallel Time Trilogy hidden truth revealing books. The profound destiny of Captain Kalem, Mayleena, and Etta become intertwined in the ongoing struggle against the tyrant Sen Dar’s quest for total dominance of life on all worlds – even unto the highest mystic realm of The Ancient One.